Construction to be complete this summer! Whether you are looking for your perfect home away from home or looking to invest in a rental property, 21 Founders Lane has all of the features the most discerning buyers require. 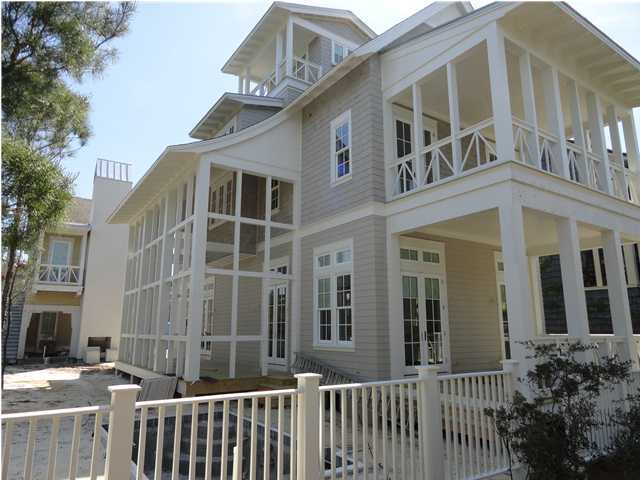 Upon entering this beautiful beach home in the highly sought after gated community of Watersound Beach, you will immediately appreciate the open floor plan accommodating family and friends. The gourmet kitchen will include commercial stainless steel appliances and custom cabinetry. The open living room features a beautiful fireplace and many doors and windows bringing focus to the elegant outdoor living space. The impressive 2 story screened-in front porch is perfect for outside dining and entertaining and overlooks the heated pool, outdoor fireplace and summer kitchen. No expense has been spared with the landscape design of this beautiful home and the outdoor living space faces a natural buffer to the park giving you privacy. The second level features the master suite and two additional bedrooms each with their own private bathroom. There is also a bonus room that could be used as a media room or office. The third level is host to the perfect kids getaway. Two more bedrooms with custom bunk beds share a full bathroom and common area large enough for a playroom. 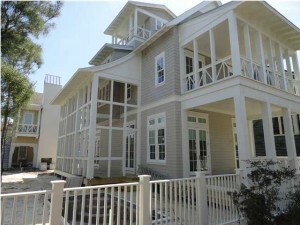 Enjoy gulf views over picturesque Watersound Beach from your tower and 4th level porches. Over the one-car garage, you will find a full carriage house complete with bedroom, living space and small kitchen.